North Korea is expanding its capacity to mine and mill natural uranium. 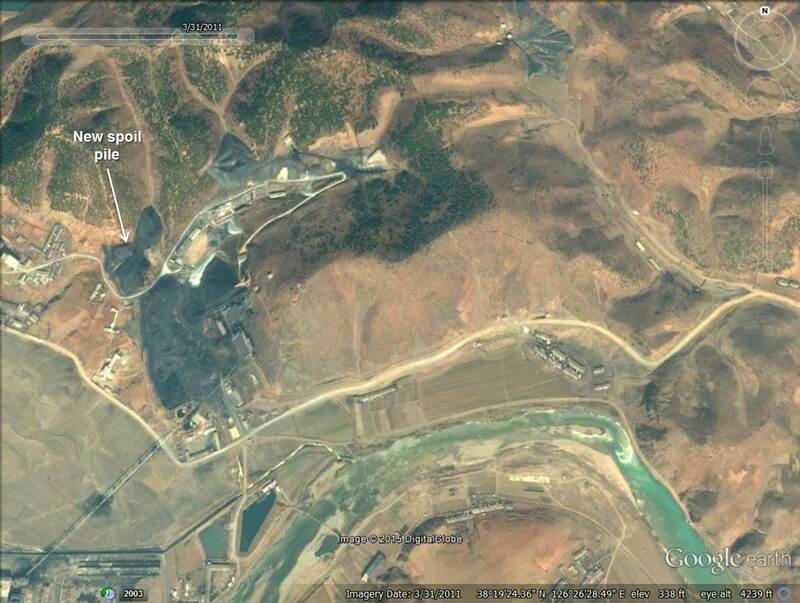 Recent commercial satellite imagery shows that, over the past year, Pyongyang has begun to refurbish a major mill located near Pyongsan that turns uranium ore into yellowcake. The renovation suggests that North Korea is preparing to expand the production of uranium from a nearby mine. The question is: What will North Korea do with this uranium? One possibility is that North Korea will enrich the uranium to expand its stockpile of nuclear weapons. Another is that Pyongyang plans to produce fuel for the Experimental Light Water Reactor under construction at its Yongbon nuclear scientific research facility as well as future light-water reactors based on that model. A major challenge in estimating the size of North Korea’s nuclear weapons stockpile is uncertainty about whether Pyongyang has additional centrifuge facilities for enriching uranium. While such facilities may be hard to detect, the expansion of mining and milling near Pyongsan may allow observers to estimate the size of North Korea’s enrichment infrastructure based on its demand for uranium. 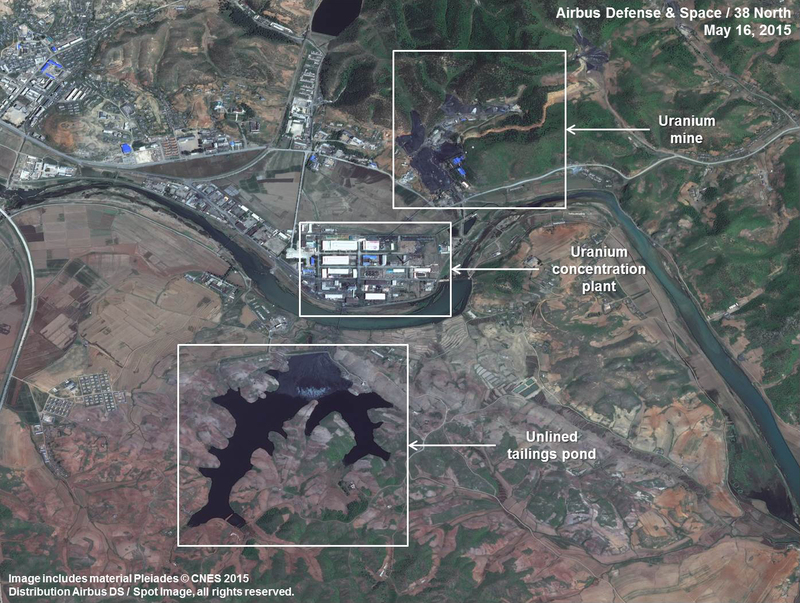 Closer scrutiny of North Korea’s uranium resources, including its other declared mines and mills as well as suspected sites, may help arrive at more accurate estimates of this key capability. While wonks have turned their pointy heads toward North Korea’s nuclear reactors, reprocessing facility and enrichment capabilities, all of these capabilities depend on a supply of natural uranium. Uranium, whether natural or enriched, is the essential fuel for nuclear reactors that produce plutonium and can also be enriched to produce nuclear weapons. The North Koreans like to brag about how much uranium they have. One North Korean publication described the DPRK’s uranium resources as “infinite.” And poor Andrea Berger, a non-proliferation expert at the Royal United Services Institute in London, even got a lecture on the subject from a North Korean official. As it turns out, though, North Korea’s uranium resources are probably paltry, which means that we may be able to locate and monitor a relatively small number of sites. That, in turn could help us get a better grip on the North’s ability to produce reactor fuel and bombs. Thanks to the collapse of the Soviet Union, scholars now have access to internal Soviet and Warsaw Pact documents describing North Korea’s efforts to seek assistance in developing its uranium resources. North Korea asked the Soviet Union for help in the field of the uranium prospecting as early as 1948. The request is described in an internal Soviet memo, translated by the Wilson Center’s North Korea International Documentation Project, which suggests such prospecting be postponed. North Korea kept bugging the Soviets, though. By the early 1960s, the Soviets had completed a survey, but concluded North Korean uranium deposits were too poor for exploitation. Two Soviet specialists told their Ambassador in Pyongyang: “Korean uranium ore is not rich and is very scarce. The mining and processing of such ore will be extremely expensive for the Koreans.” As it turns out, the North Koreans didn’t care that the uranium was extremely expensive. If you wonder whether Kim Il Sung wanted a bomb or not, his abiding interest in a domestic source of uranium at any cost is a hint. The memos also include technical information. One memo, reporting on a 1979 North Korean effort to acquire uranium mining equipment from Czechoslovakia (hey, remember Czechoslovakia?) states: “[T]he DPRK has two important uranium quarries. In one of these two places, the uranium content of the ore is 0.26 percent, while in the other it is 0.086 percent.” Based on other information released by the Soviet Union, it appears these mines are near Pakchon and Pyongsan, with Pyongsan likely having the higher quality ore. In 1985, the North Koreans were still pressing the Soviets to speed up prospecting for new sources of ore. In 1992, the DPRK declared, as part of its Comprehensive Safeguards Agreement with the International Atomic Energy Agency (IAEA), two uranium mines (the Wolbisan Uranium Mine and the Pyongsan Uranium Mine) and two mills for concentration (the Pakchon Uranium Concentrate Pilot Plant and the Pyongsan Uranium Concentrate Plant). While there are naturally questions about whether this declaration was complete, the claim of two uranium mines appears consistent with the Soviet surveys. Figure 1. 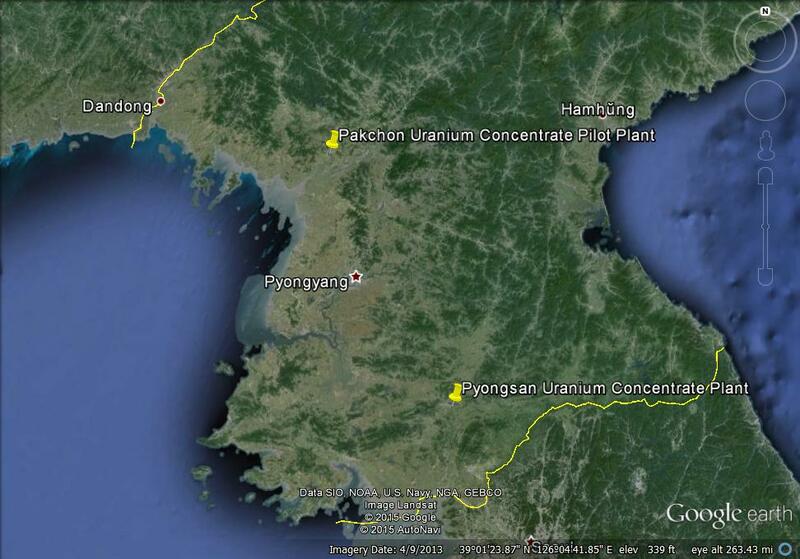 North Korea’s Uranium Concentrate Plants. Figure 2. Overview of the Pyongsan Uranium Mine and Uranium Concentration Plant. 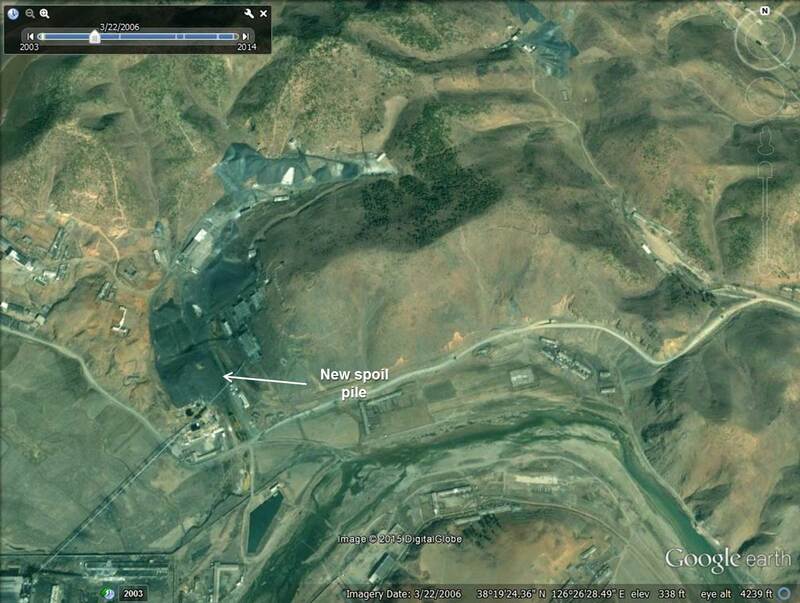 Pyongsan is believed to the most important uranium mine and mill in North Korea. (The other mill, near Pakchon, was described as a pilot facility.) Commercial satellite imagery from Digital Globe and Airbus Defense and Space show the layout of the mine and mill that turns uranium ore into yellowcake. The mine is connected to the mill by a conveyor belt that brings uranium ore into the mill for processing. 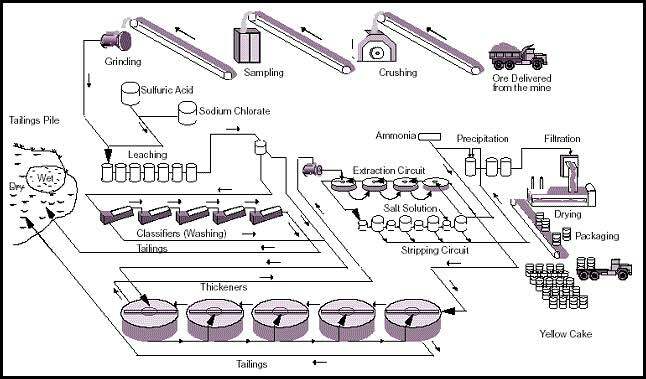 The various structures within the mill are connected to one another allowing the uranium to be processed in stages (see figure 2 for schematic of a typical mill). Finally, the mill is connected to a large pond where tailings are dumped. Figure 3. Schematic of a typical mill. 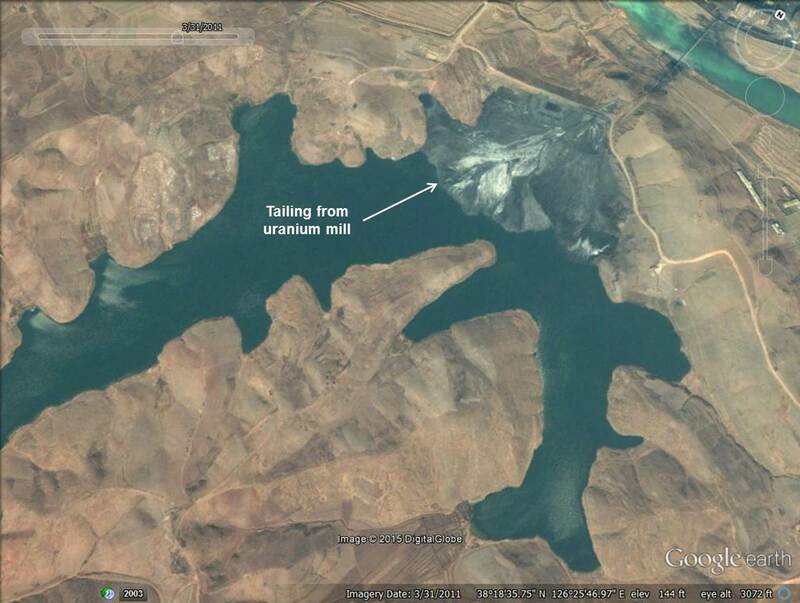 While North Korea has operated the facility intermittently over the past decade, new spoil and tailings appeared sometime between 2006-2011, suggesting that the North resumed uranium mining and milling during that period after what appears to have been a lull of many years. This uranium may have been fabricated into new fuel rods for the 5 MWe gas graphite reactor. North Korea had only 2,500 fresh fuel rods for this reactor—less than a third of a full load. (North Korea also had 12,000 rods that had been fabricated for the never completed 50 MWth reactor, which could be converted into reactor fuel.) 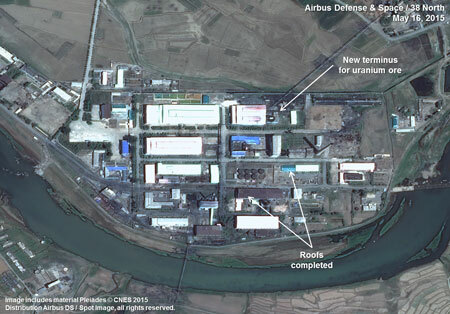 The uranium might also have been converted into uranium hexafluoride (UF6) that could be enriched to build nuclear weapons, either at the enrichment plant that the North constructed and revealed to Americans visiting Yongbyon in 2010 or at a covert site. Based on the size of the spoil pile and the tailings, it may be possible to make a rough estimate of how much uranium was recovered, but this estimate would be very approximate. However, North Korea seems to be mining more uranium to meet what may be increasing needs for fuel or bombs. Figure 4. 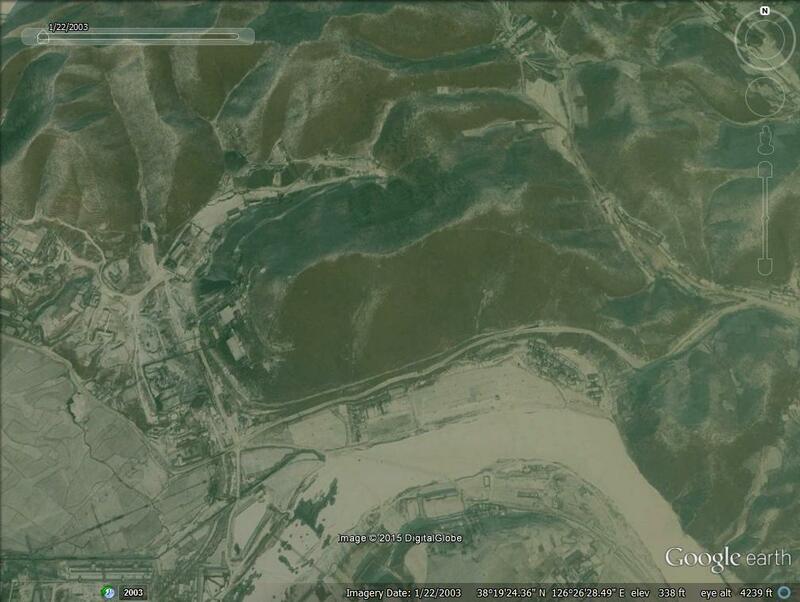 Images of the uranium mine from 2003, 2006 and 2011 show new spoil piles in 2006 and 2011. The tailings are dumped into a nearby pond that is unlined and surrounded by farms. (If you happen to visit Pyongsan, I would strongly recommend passing on the local produce.) 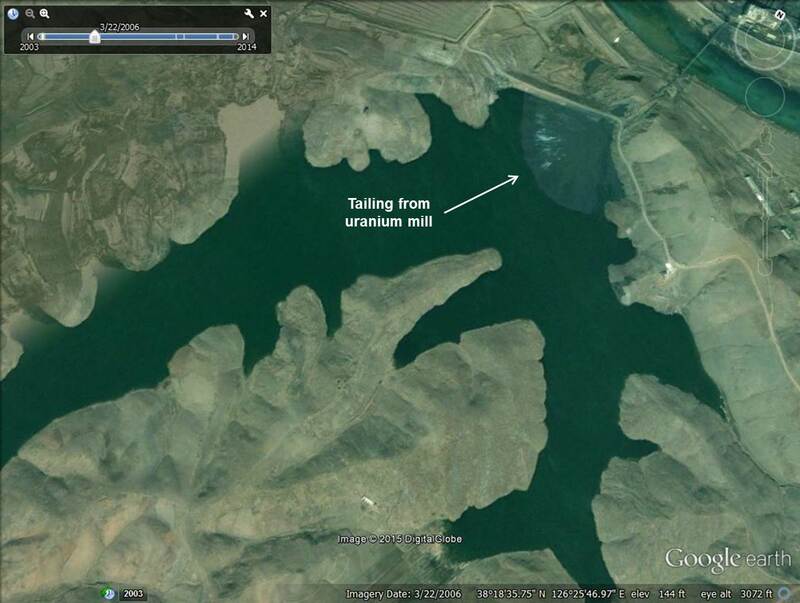 Just as the mine shows new spoil piles between 2006-2011, new tailings appeared in the pond over the same period, demonstrating that the uranium had been processed in the mill. Figure 5. 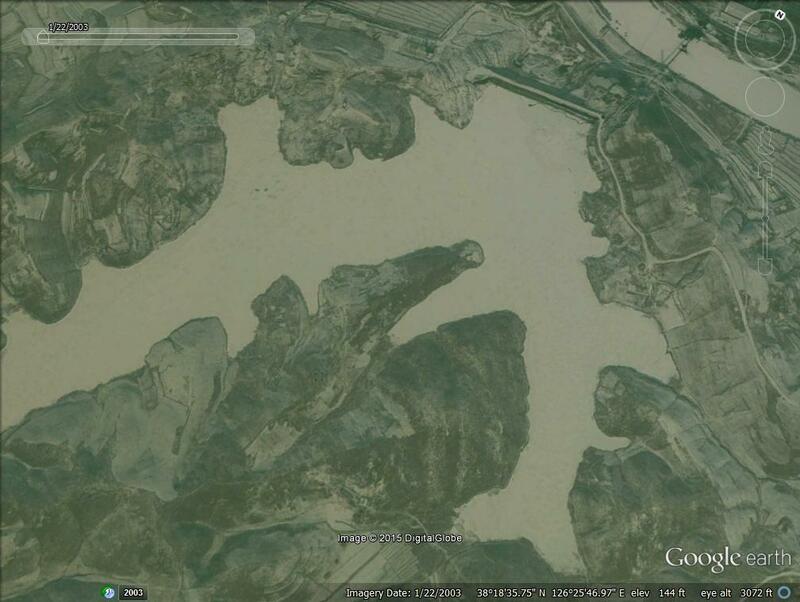 Images of the tailings pond from 2003, 2006 and 2011 show new tailings in 2006 and 2011. The most recent commercial satellite imagery indicates that the “Uranium Concentration Plant” plant is currently undergoing significant refurbishment. Since 2013, most of the buildings have received new roofs. The terminus of the conveyor belt was demolished and rebuilt. Other buildings appear to have been gutted and are now in the process of being rebuilt with new roofing. The significant investment in refurbishing the mill suggests that North Korea is expecting to process significant amounts of uranium, either from the Pyongsan mine or other uranium mines. Figure 6. North Korea has undertaken a significant refurbishment of the Pyongsan Uranium Concentration Plant since 2013. Quite apart from the nonproliferation aspect of any future nuclear agreement with North Korea, it is important for the health and safety of the local community to clean this site up. While that seems unlikely in the current environment, remediation of this site—and probably countless others in the DPRK—could be an important task if nuclear diplomacy restarts with the North in the future. A possible model is the assistance the European Union provided Estonia in cleaning up the uranium mill at Sillamäe. 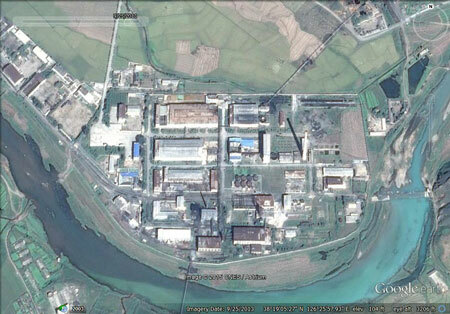 Pyongyang appears to be modernizing a key facility associated with the production of uranium yellowcake. This suggests that North Korea intends to mine and mill a significant amount of uranium that could serve as fuel for expanding its nuclear weapons stockpile, as well as for providing fuel for future light-water reactors that may be in the planning phase. Mapping and monitoring North Korea’s infrastructure for producing uranium can help estimate the size of North Korea’s uranium enrichment program which is otherwise shrouded in secrecy. Jeffrey Lewis is Director of the East Asia Nonproliferation Program at the James Martin Center for Nonproliferation Studies (CNS), Middlebury Institute of International Studies at Monterey, and a frequent contributor to 38 North. “Yellowcake” is milled uranium oxide, known to chemists as U3O8 and is a first step toward enriched uranium. The milling process rids uranium ore of useless minerals and results in a coarse, oxidized power that is often yellow in color—though color can vary depending on levels of hydration and impurities—commonly referred to as “yellowcake.” The powder must then be converted into uranium hexafluoride (UF6) before it can be enriched—the process that makes the sort of uranium used by nuclear power plants and bombs. See: Memorandum of the Special Committee of the CC CPSU postponing the geological prospecting for uranium in North Korea, April 12, 1948. Conversation Between Soviet Ambassador In North Korea Vasily Moskovsky And Soviet Specialists In North Korea, September 27, 1963. Telegram, Embassy Of Hungary In North Korea To The Hungarian Foreign Ministry, February 17, 1979. New challenge after the “Cold War”: the proliferation of weapons of mass destruction, (SVR External Report, 1993), https://web.archive.org/web/20090210064145/http://svr.gov.ru/material/2-13-10.html.